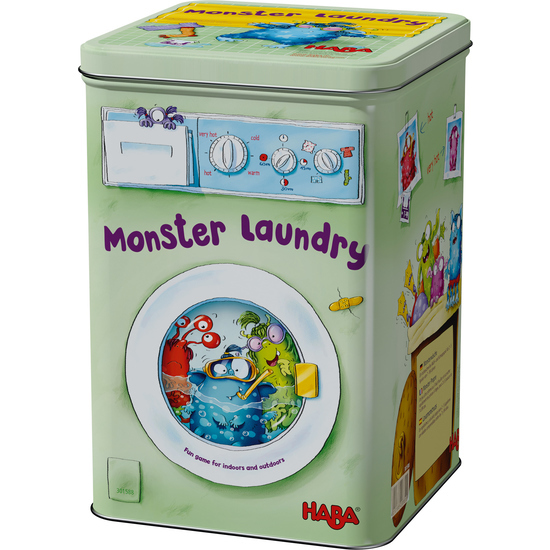 It's livening up in the monster laundry room, as all of the monsters want to get rid of the yucky smell. Amidst all the scrubbing, rinsing and splashing water is going everywhere! It's laundry bedlam..... who is going to throw themselves into the fray and create order out of chaos? Only the fastest players can keep track and end up with the most golden clothespins. Contents: 48 monster cards (8 different monsters per color; 4 spotted, 4 starred), 40 clothespins (8 pins per color), 12 golden clothespins, 1 elastic washing line, 1 set of game instructions.